Rockport certainly get around, I lost count of the number of Rockport titles I have in my collection. More worringly, I dread think how much I have spent in total. I picked this book up in Border’s about 6 months ago and was immediately drawn to it after flicking through the pages. Moods, Concepts, Time and Context and Age Groups. What set’s this type book out from the many others is the combination of material referenced. For each main group, you get a page of appropriate color palettes and schemes that match the mood of that group. So not only can you quickly find fonts based on group and topic, but if you are color challenged, then there are some decent colour swatches to try. You get about 6 pages at the beginning of colour and font style basics which is useful for the beginner designer. It details the anatomy of fonts and letter styles in a very clean and well presented format. 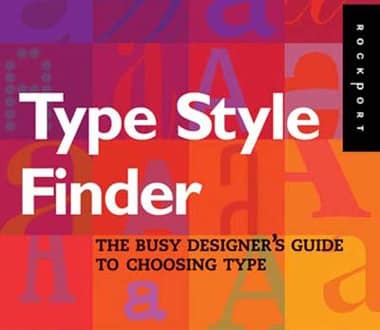 It’s a easy book to read and to reference and as the title suggests, it is ideal for those quick urgent jobs where your ability to think has ceased and you need helping choosing appropriately styled fonts. Having a number of years experience with typography and design didn’t stop me from wanting to buy this book. And indeed, it still proves to be a well thumbed and has countless tabbed sticky notes on many pages. Yes, it’s not the bible or the entire type collection of Adobe, but it does a great job of making things seem less ‘infinite’ where font choices are concerned. It may not be for everyone, especially those gifted with wonderful memory, but I would say it’s a great book for those that need a small hand in choosing styles of fonts for various designs in a hurry.